Did you know that you can speed up VISUAL loading times by copying NETHASP.INI to the EXE folder? First of all, we must explain HASP. HASP stands for 'Hardware Against Software Piracy.' A HASP dongle is usually a small USB hardware device that is connected to a PC to act as a software key, allowing an application to run. NETHASP.INI is a small INI file that is not installed by default. When configured correctly, it prevents the VISUAL applications from checking for a HASP device on the PC. Because it prevents checking for a HASP device, the INI file can speed up the loading time for the main VISUAL Application menu, as well as individual VISUAL Applications. 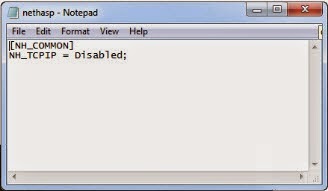 You can get the NETHASP.INI file from Infor Xtreme, KB 738703; or create with Notepad.exe (see graphic below). After downloading the file, copy it to the VISUAL Executables folder either on the network file server, or to each client PC if installed locally.